Review Context: I have played Senran Kagura Burst. I’m a huge fan of the beat ’em up genre that is not fading away, but it’s becoming rare to find. Disclosure: This review was based off of a review copy provided via ONE PR Studio. After the success of Senran Kagura Burst (download only) in the US, XSEED Games decided to bring the sequel stateside. With Senran Kagura 2: Deep Crimson, there is now a limited edition physical copy you can buy, or you can still buy it via download. 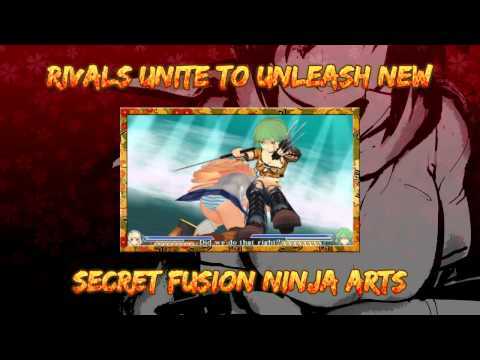 There is also an anime series if the game isn’t enough for you to watch these shinobi warriors in action. So does Senran Kagura 2: Deep Crimson improve on what was needed from Senran Kagura Burst, or will you be too brainwashed by the fan service to notice? Bigger is better. What I mean by that is the visuals have been improved with better character models and bigger environments, since the game now plays in 3D instead of 2D. The frame rate is much better, with little slowdown (even with 3D turned on) compared to Burst. 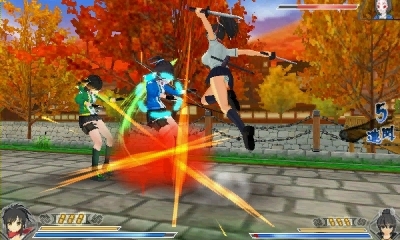 In Burst, the game played in 2D, with the 3D only being available during the transformation scene. Now the 3D has a nice scale of depth to the battles, especially the huge boss battles. Of course, the improvement also means better character movement with the clothes and the “bounce physics.” If the site of seeing female ninjas getting their clothes ripped off is too much, you can now disable the feature in the options menu. The opening anime cutscene gives you a taste of the type of game you are about to experience. While the controls remain the same, with the game now being a 3D beat ’em up, the D-pad is no longer used for movement. If you own the New 3DS XL or the Circle Pad Pro, the game supports the nub stick for camera movement. Without it, the camera movement is done automatically, which proves to be a bad thing as I’ll explain later on. On certain missions you will have a partner to create tag team moves with the help of the A button, while in solo levels that button is used to link combos into the air. One of biggest gripes with Burst was the lack of a lock-on feature, but that is now added on here with Up on the D-pad to lock on the closest enemies, while the R button does a quick sprint to make you immune to damage for a short period. At the end of each level, the character will pose for you, and with the 3DS’ gyroscope, you can move the camera for (clears throat) a better angle. You can use the touch screen in the hub area to get to certain areas quickly. I should point out that if you want to save with the touch screen the yes option is on the left instead of right. With every franchise sequel new features are added, usually to help make the game feel fresh, while keeping old content fans are familiar with. Deep Crimson has added a lot of features to keep you busy. The biggest change (no pun intended) is that the game is 3D, while Burst was 2D. Burst was fun, as I was able to pull 200 plus combos at ease, but the levels were long and tedious, while in Deep Crimson pulling off combos takes patience, as there will be times when you start a combo only to be hitting air as your enemy moves. When you use heavy attacks the impact spreads farther to help defeat enemies near you. Since I played this on my normal 3DS, the camera control is done automatically, which can lead to you getting hit off-screen. The difficulty has increased as well; I found myself getting attacked from all sides not able to put up a move. They try to fix it with a lock on system, and it’s reliable somewhat. The levels are much shorter to help you play the game is short runs if you want. The clothes rip animation is back, but it seems that after two hits you’re already down to your bikini. In Burst when your health is low the animation starts, but in Deep Crimson after the animation I see that my health is fine. The story picks up after the events of Burst, so if you don’t want to get spoiled it is best to finish up Burst beforehand. While the tone in Burst was more comedic with a touch of serious, Deep Crimson is the opposite, with a more serious tone with some elements of comedy. With this you learn that it is better to fight in pairs, and with that is the addition of co-op. While Burst is a single player experience, and one of my gripes with the game, Deep Crimson adds co-op for local and online, but the mode isn’t available immediately. To unlock co-op you must complete the first chapter of the story. The second chapter is where they begin to explain the importance of teaming up. It is there where you are able to compete in co-op missions. Besides support for local and online co-op, there is even StreetPass support. I have tried online support and the experience is positive. Despite the hectic enemies attacking us, the frame rate never dropped, nor did I suffer any online lag. You can play co-op levels from the story or do specific gauntlet missions. Like with Burst, as you level up your character, you unlock more combo skills for greater damage. With co-op, as you do tag moves your partner’s trust is increased for stronger damage as well. You can mix partners or go with the recommended team. Yoma’s Nest has you going through gauntlet matches without refilling your health to see how tough you are. As you reach farther into the nest you can unlock new weapons for your warrior to use in the story or co-op. Special Missions have you completing levels with a task to perform. Mission Shop is where you can purchase extra levels and content. If you have saved data from Burst, you can unlock Murasame, the series’ first male fighter. If you don’t have the save file you can purchase him on the eShop. As of this writing, there is only one character and one mission pack, with more to follow. Online content is also absent in Burst, so with the Mission shop more content is a plus. The amount of customization is back with more features. With the Dressing room, you can change your fighter’s appearance, and as you level up your fighter more costumes will be unlocked. Since the franchise is known for its well-endowed fighters, you can have them strike a pose in camera mode, with some of the poses letting you know this a Mature rated game, with the character saying random things as you change posing position. If you decide to see your character pose for you in 3D, the frame rate takes a hit. But wait, there’s more… With Viewer Mode you have the full view of the character. With that the character’s upper body will be on the top screen, while the lower body is on the touch screen. You also have to option to switch the view. I will let you do the math of what this mode is made for. If you still want to express your love for the game you can dust off your 3DS AR cards, as the game supports AR pictures. With this you can have the characters be in real photos. Like Burst, the game’s voice acting is Japanese with English subtitles. During gameplay, the annoying death screams of the enemies from Burst have been lowered, while we earned an announcer saying, “Advantage” every time the character’s clothes are ripped. What makes it funny is that each chapter has a different voice to keep it from getting annoying. The game’s soundtrack now has a more serious tone with some comedic music thrown in for the small moments, but when the fun stops, the music goes back to being serious. I couldn’t help but notice one music tone is taken from Muramasa: The Demon Blade. Dialogue is discussed when you are fighting in battle, but you’ll be too busy fighting to look at the subtitles. I have a venture that I am simply now running on, and I’ve been at the look out for such info. the meal!! But yeah, thanx for spending the time to talk about this topic here on your internet site.